Discussion in 'Off Topic' started by Naso, Jun 21, 2009. 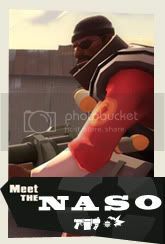 Just made this spray to use in TF2 since I didn't have one, and I would love too see your guys new sprays in here too! That won't fit into TF2. The width and heights have to be powers of two. I currently be using this. Nice. I don't usually use a spray in TF2, I think I have the 'Your point is being Captured' NERF NOW! picture. Too lazy to make a good one. Yeah, I saw the fade away thing and I was like wtf.. How did you manage that? I've been using this one for a year or so. Haha political, nice. Nineaxis it's still a cool spray though! Ive never messed with the proxy settings of the vmts. I made this one around November or so last year. 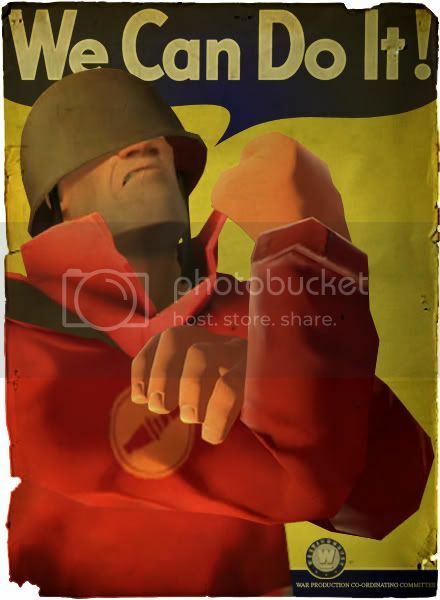 Wanted to make one in keeping with the WW1/2 propaganda trend in sprays. It was made before gmod and all that, so I manually posed him with screencaps from "meet the soldier"
I know I should use something better. My avatar IS my spray... I try to stick it right on an edge, so it looks like the ostrich is peeking around a corner, or out from behind something, or through a window. well, same thing can be done using the vmts, but is a lot harder.